Next week sees People’s Palace Projects hosting another Brazilian delegation to the UK as part of our growing Points of Contact programme. 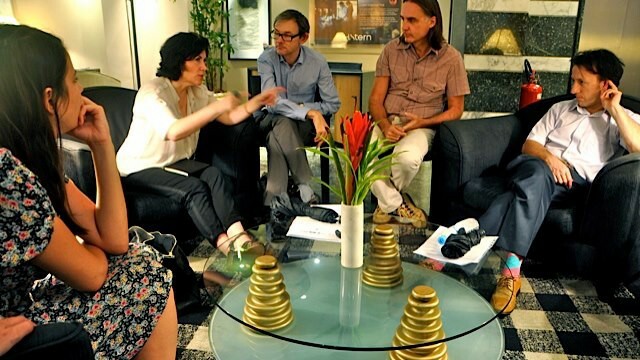 Eight delegates from Rio and Salvador will be here discussing the development of programmes and policies within the creative industries concerned with the training and accreditation of young people from low-income backgrounds. The week gets going with Train the Trainer sessions with our partners from CCS and guests in Thurrock at The Backstage Centre. These sessions share and debate Brazilian and British vocational training within cultural sector. Travelling Tuesday takes the delegation to Cardiff and back to be hosted by Simon Dancey at British Council Wales,meeting organisations from National Theatre Wales and Welsh National Opera to major Welsh Higher Education institutions; and Minister, Edwina Hart. The Brazilians spend the next two days at the National Skills Academy conference: The Power of Collaboration at the NSA Backstage Centre in Purfleet, Essex. The two-day conference sees key decision makers from across the creative and cultural sectors come together to discuss the challenges and opportunities that lay ahead. During the evenings we’ll be hosted by our friends at Roundhouse and Circus Space (with Jenny Sealey) looking at the young people and disabled performers who have experienced their life-changing training programmes. The week draws to a close with Friday’s discussions firstly at Spring Gardens, hosted by the British Council and then at the Arts Council for an afternoon roundtable including Spitalfields Music, Peshkar Productions, and Livity. All this and there’s still time to catch The Curious Incident of the Dog in the Night Time, ballet at the Royal Opera House, and 1927 in Brighton. It’s going to be quite a week! Arriving on Sunday, the delegation comprises of: Carla Camurati, Director of Theatro Municipal Rio de Janeiro (Rio’s Opera House); Ana Luisa Lima, TMRJ Executive Producer; Gringo Cardia, Director of Spectaculu (a production training school in Rio); Marcos André, Rio State Culture Secretariat; Junior Perim, Director of Rio circus-based training & performance NGO, Crescer e Viver; Beth Rangel, Director of the Centre for Arts Training, in the Brazilian state of Bahia; Heliana Marinho, responsible for Creative Economy within SEBRAE; and Rita Aquino, producer and training coordinator at FIAC/International Festival of Theatre, (takes place in Salvador every September). You can follow the delegation’s adventures on twitter, using #POC2013. This programme has been made possible through funding from British Council Wales, Cultural & Creative Skills, and British Council Brazil.